RIO DE JANEIRO, BRAZIL – Often thought to be an elitist sport for the wealthy, social program StreetGolf is aiming to show that golf can be for everyone. The organization, launched at the Maracanã Stadium in Rio de Janeiro yesterday, brings the game of golf to the city’s schools and communities showing the joy of the sport and how accessible it can be. The StreetGolf Program opens up golf for children of all ages and backgrounds, photo by Lisa Flueckiger. In the countdown for the 2016 Olympics, where golf will make a comeback as one of the disciplines, the StreetGolf Program also wants to ensure an Olympic legacy of the sport in Rio de Janeiro, where currently a new public golf course is under construction in Barra da Tijuca. The StreetGolf organization supported by the Rio Golf Federation, as well as the R&A and the Golf Foundation from the UK, teaches street golf, a style of play with adapted and portable equipment that can be set up anywhere. “The focus is on street golf because everyone can play. You don’t have to go to a club to play. You could even play at the beach,” Katie Moggan from the Golf Foundation UK who trained the children, told The Rio Times. That the sport can truly be played anywhere was shown at the launch event on May 6th at the Maracanã, where sixteen children between 8-16 years old from the Japeri community played five challenges around the stadium. The challenges were set up in the hallways of the stadium, as well as the side of the pitch, showing how little equipment actually is needed to already play some golf. Children from Japeri play golf in the Maracanã’s hallways during the StreetGolf launch event, photo by Lisa Flueckiger. In Japeri already a project exists that brings the joy of golf to the children of the community, as the first public golf course in Brazil was built in the community by caddies from the Gávea golf course in 2005. “Sports take the children off the streets. In Japeri there was nothing [to do before the golf course], no park, no swimming pool, no football pitch,” Vicky White, a driving force behind the course and former Rio Golf Federation President, explained. “We opened golf to everyone,” she added. 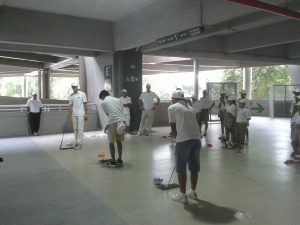 Besides Japeri, the StreetGolf Program will now bring golf to schools and communities throughout Rio de Janeiro. In the first twelves months of the program, fifteen schools and their students will get the opportunity to play and learn about the sports benefiting more than 1,500 children. The 10 to 20 most enthusiastic children from every school get to participate in three golf tournaments. The top ten from those tournaments ten get to participate in a Pro-Am tournament shortly before the Olympic Games and play with sport, TV and music stars. Yet, the focus is on reaching disadvantaged communities in general and to create a genuine impact on the children through participation and enjoyment of the sport and teaching golf’s key values of respect, integrity, self-awareness and physical fitness.